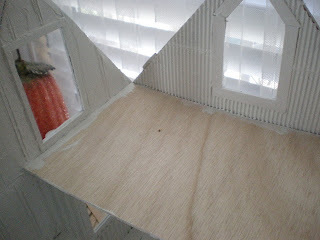 I have started the interior . 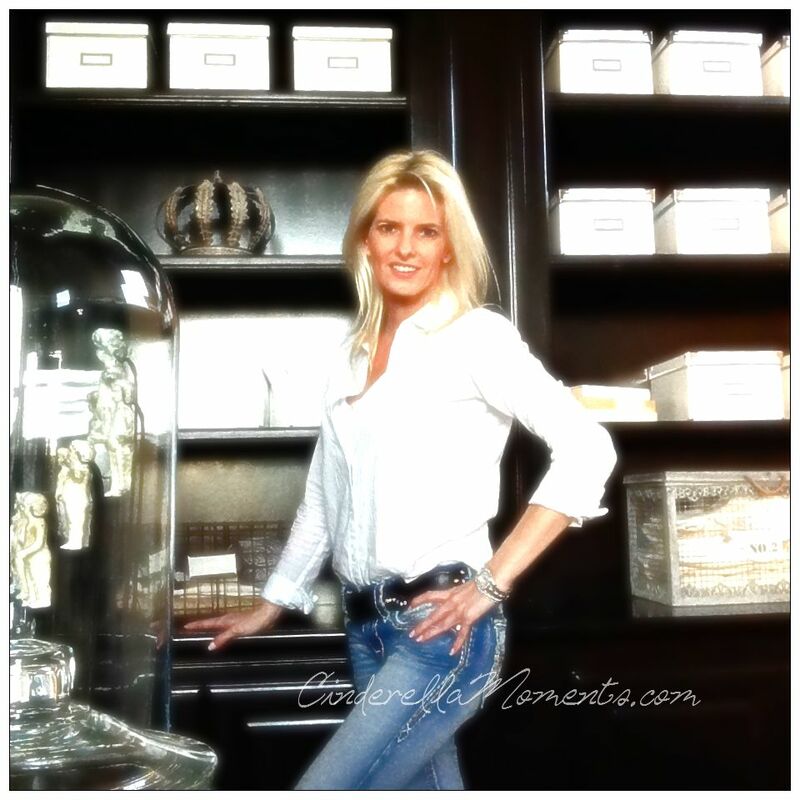 I have different types of wainscoting. 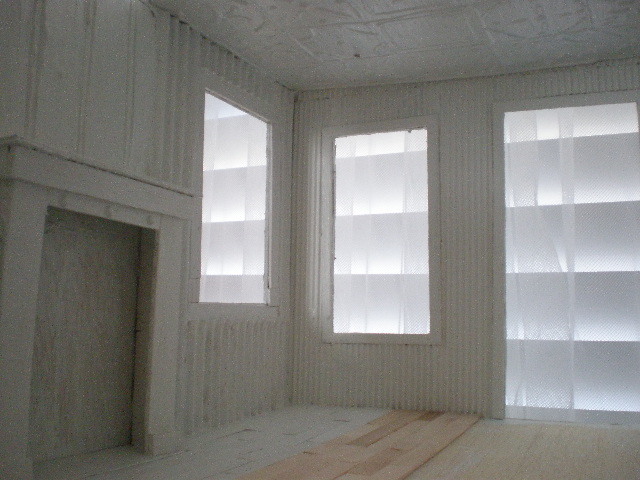 The skinny ridge wainscoting is cardboard with one layer stripped off to reveal the ridges. 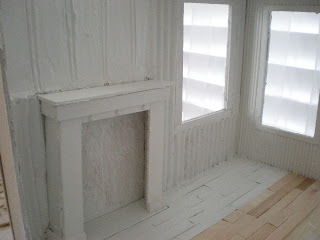 The finish above the mantle is plaster that I sculpted with a exacto knife to look like a wider plank wainscoting. 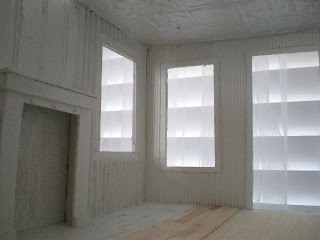 I did the same on the back wall and the wall with 3 windows. I started the wood floor. And gave everything its first coat of white. 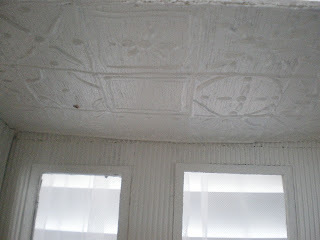 This ceiling is done with the hot glue gun following a simple pattern to get a tin tile effect. I'll add a little silver later on. This is the loft so far. You can still vote for my sisters' Florida contest. Absolutley mesmerizing - like watching a movie set come together. Loved the Glitter magic from the last post. Me encantan tus trabajos!!!! Lo esplicas tan facíl!!!! Ya he votado!!! muy bien y rapido!!!! les deseo suerte!!! y que este voto desde Spain, les sirva de ayuda!!! Ahora intentare votar y espero que tengan suerte. It looks so serene and bright, and your hot glue gun tiles are soooo nice. Did the voting again today.